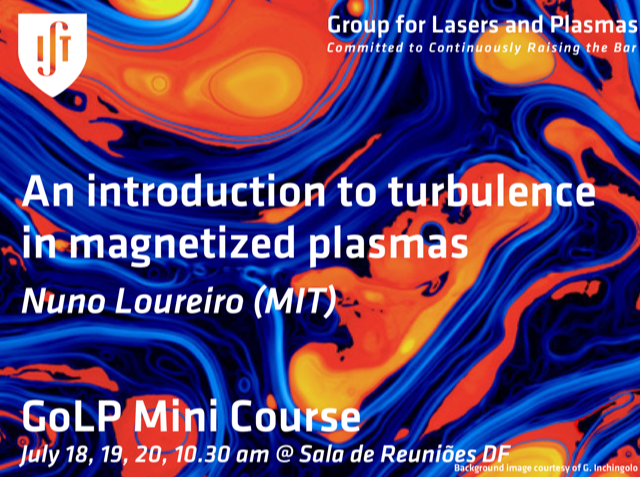 On July 18-20 2018, GoLP will host the mini course “An introduction to turbulence in magnetized plasmas”, by Nuno Loureiro (MIT), aimed at introducing basic notions of turbulence in magnetized plasmas to a non-expert audience. The course will be held at Sala de Reuniões DF (Pavilhão Física) at IST, from 10:30 to 12:00. For further details, see the full announcement below. This short course aims to introduce basic notions of turbulence in magnetized plasmas to a non-expert audience. No significant previous knowledge of plasma physics or fluid dynamics is assumed. The course will cover the standard Kolmogorov picture of turbulence in neutral fluids, followed by its extension to magnetohydrodynamics, including the Goldreich-Sridhar (GS95) theory and its recent amendments. The understanding of the latter requires basic notions of magnetic reconnection, which will be briefly covered. The extension of these theories to plasmas composed of electrons and positrons (pair plasmas) will also be discussed. Partially supported by the European Research Council and the National Science Foundation. Nuno Loureiro is Associate Professor of Nuclear Science and Engineering and Associate Professor of Physics at MIT. He obtained his undergraduate degree in Physics at Instituto Superior Técnico in 2000 and his Ph.D. in Physics at Imperial College in London (UK) in 2005. His domain of expertise is theoretical and numerical plasma physics, with emphasis on magnetic reconnection, turbulence, magnetic field generation and amplification, and confinement and transport in fusion plasmas. He was awarded the Thomas H. Stix Award for Outstanding Early Career Contributions to Plasma Physics Research (American Physical Society) in 2015, and was the recipient of an NSF CAREER award in 2017.